Practice Areas: insurance coverage litigation and defense of professional and general liability claims. 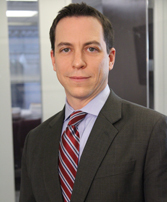 Michael L. Leest joined the firm as Partner in December 2013. Mr. Leest concentrates his practice in insurance coverage litigation and defense of professional and general liability claims. His extensive experience as counsel for insurance companies allows him to offer clients a unique perspective on the issues they are facing. While with several insurance carriers, he handled and managed numerous lines of businesses including errors and omissions, employment practices, director and officer, professional liability, general liability and transportation. Mr. Leest guides clients by offering practical strategies and suggestions throughout the course of litigation in an effort to obtain the best possible resolution. Mr. Leest received his B.A. from State University of New York at Albany in 1994 and a J.D. from Pace University School of Law in 2001. He was admitted to the New York Bar in 2002.